Hundreds of Wiganers on social media have expressed their shock at the sentences handed down to the two teenagers who were in a stolen van which hit a three-year-old-boy leaving him with serious injuries. Leo Durrington, who was three at the time of the accident, was walking along Wigan Road in Leigh on the morning of October 30, with his mother, when the speeding white Ford Transit ploughed into him, hurling him like a ragdoll into the car park of the Tamar pub. It was being driven by a 16-year-old Abram boy, with a 15-year-old in the passenger seat. Yesterday, both youngsters wept as they entered the courtroom for their separate sentences. 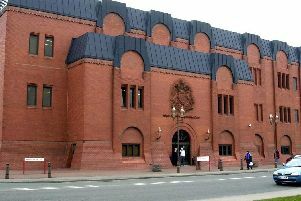 The younger boy was first to appear before the court, and was given a referral order and £20 victim surcharge, after admitting to being carried in a stolen vehicle. At the time, he had been arrested and bailed four days earlier for a string of offences including taking a van without consent, interfering with vehicles, criminal damage to a car and an assault on another youth which was filmed and shared on social media. Tracey Barker-Hall posted: Wept!!!!! They'll not have wept half as much as the little boy's family! What an absolute joke of a sentence! Ann Gardner posted: If it was up to me they would be weeping forever behind bars. Way too lenient that. Disgraceful! Susan Knowles posted: Absolutely disgusting this soft sentencing is beyond belief. Feel so sorry for this little boy and his family. Alan Hewison posted: An absolute disgrace. This is not justice for this little boy. Marie Johnson posted: Absolutely ridiculous!!!! They have left this poor boy with serious head injuries and that sentence is a joke. Our justice system is a JOKE! Martin Crank posted: Should of slammed them both for max sentence. Maybe only 2 years max they can get but it's a joke what they gave them. Louise Birchall posted: That sentence is an absolute joke. Leo's family must be so angry. John Armstrong posted: Well ladies and gentlemen, now we know the value of a child’s life, £50. I’m disgusted in the teenagers but even more so in the cowards that gave this pathetic sentence. Gemma Kenwright said: Utterly heartbroken for Leo’s family. This sentence is an absolute insult to that little boy who’s recovery will indefinitely take longer than that sentence! Mark Taylor posted: Speechless. Leo’s poor family must feel so cheated. Laura Elizabeth Marsh-Plested posted:The fines cover 8 days of hospital parking. What are they compensating?? The sentences are diabolical. Stephanie Newland posted: This is disgusting. What type of message is this sending out? My heart goes out to the boy & his family who will have to live with the effects of this accident well beyond the 12 months sentence giving to the offender. Steph Charnock posted: Their sentences are an utter joke. Meanwhile poor little Leo is still in hospital with probable life changing injuries. Joy Waugh posted: Shocking sentences and £50 in total victim surcharges! Gutted for the family as this isn’t justice. Leandra Mallinson posted: Appalling ... 6 months behind bars and he's left a small child unable to walk like he once did, utterly outrageous. Jane Frodsham posted: The family of Leo must feel so let down by our wonderful justice system!! The Magistrate who passed that sentence ought to be ashamed of himself. Should have got the longest possible custodial sentence, not a slap on the wrist!! Dave Cooper posted: I honestly thought this was a sick joke. Gary Frodsham posted: Unreal. That's our justice system for you, a complete joke. Sgt Lee Westhead of GMP’s Serious Collision Investigation Unit, said: "The devastation caused is all too apparent. Leo’s family has been left distraught by what happened that day and I am glad that we were able to identify these teenagers so quickly. "They showed no regard for anyone other than themselves. They left Leo lying in the road without a seconds thought. "Thankfully thanks to the prompt medical attention given to Leo at the scene and the incredible treatment from the staff at Manchester Children’s Hospital, Leo is now recovering with his devoted family by his bedside."